This example presents the anchorage solution in tension for a CIP anchor bolt in cracked concrete under seismic loading conditions in a reinforced concrete podium slab using anchor reinforcement. It is based on test results using flat bearing plates in which the full bearing surface is situated at the effective embedment depth. Other bearing surface geometries are not compatible with these test results. The calculation follows ACI 318-14 for the design of an anchor in tension, with AISC 360-16 used for the anchor allowable tensile steel strength. The witnessed testing conducted by Simpson Strong-Tie was used to validate ACI 318-14, Chapter 17 design concepts for anchor reinforcement and the need to design the structural slab to meet amplified 17.2.3.4.3 (a) anchor forces for use in SDC C–F. The design strength is based upon the ACI 318-14, Chapter 17 failure modes of tensile steel strength, concrete breakout strength, anchor pullout, concrete side-face blowout and anchor reinforcement strength. Additional failure modes observed in the testing validated greater capacities when anchor reinforcement is used, and those empirical findings are considered for that limit state. 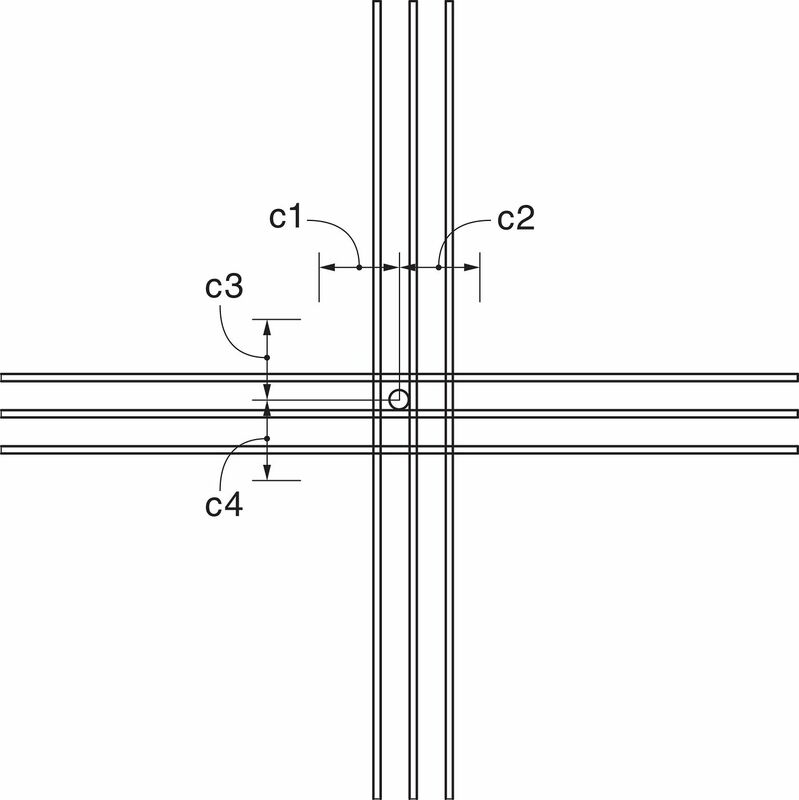 See strongtie.com for detailed calculations for all solutions shown on Simpson Strong-Tie website design tables. Slab thickness: t = 12 in. Initial anchor: hef = 9.39 in. hef x 1.5 = 14.09 in. where hef is based on Simpson Strong-Tie ABL height, heavy hex nut height and plate thickness. Project the failure surface, c, outward 1.5hef from the effective perimeter of the plate. Testing performed by Simpson Strong-Tie indicates that when anchor reinforcement (A.R.) is added to these shallow slabs, ultimate capacity is a combination of A.R. resistance acting simultaneously with concrete breakout resistance. Using the test results, the % contribution to the measured peak capacity of both the inner concrete cone and the Anchor Reinforcement (A.R.) were determined. Both of these contributions are dependent on slab thickness. For inner concrete cone, that percentage contribution is based on a comparison of the Normalized Breakout Capacity vs. the Calculated Uncracked Breakout Capacity. For anchor reinforcement contribution, that percentage is based on a comparison of the Maximum Possible A.R. Contribution vs. Measured A.R. Contribution. Based on testing, 41% of the contribution is coming from the inner concrete cone. Based on testing, 100% of the anchor reinforcement is contributing. Testing indicates that an additional failure mode is possible with a shallow embedment when resisting the breakout area with anchor reinforcement. A vertical "block shear" can form at the outer edges of the bearing plate. This "block shear" is separate from pullout and is dependent on embedment depth, bearing surface area and concrete strength. Size bearing plate so that "block shear" is not the design limit state.